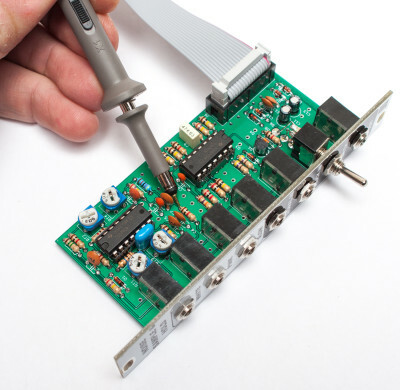 Synthrotek is pleased to offer a complete line of eurorack synthesizer modules, power, cases and accessories in both complete units kits and panels & pcbs. We now offer a very complete analog modular monophonic voice with many accompanying utility modules. This new complete voice is the product of a collaboration with synth guru George Mattson, who now joins us in releasing our new MST (Mattson – Synthrotek) line of premium modules. The MST Noise/ Sample & Hold / Track & Hold Module supplies you with all the noise and random goodness you need in one small 4HP package. White, pink, and slow-random noise are just a patch away. The white noise is normalled to the signal input or input your signal of choice and break the normalled connection. 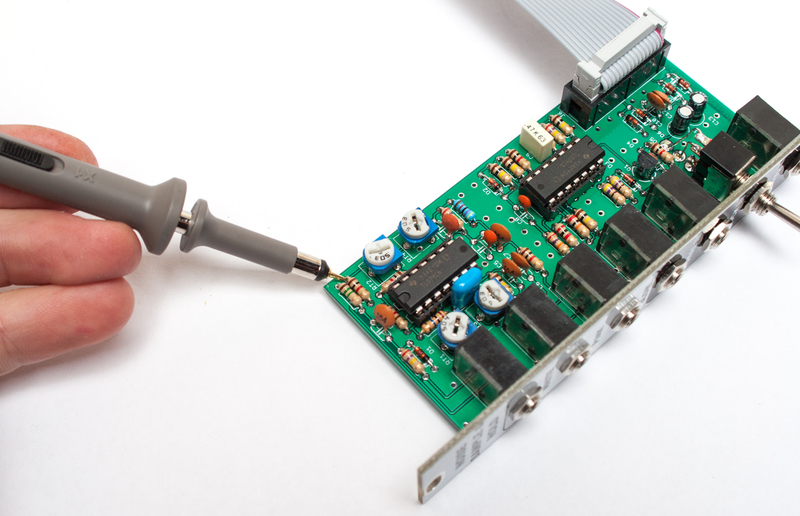 To activate either the S&H or T&H, just supply the module with your clock source to start generating stepped random control voltages. Roughly Center all four trim pots. Place the scope probe on the White Noise output prior to the 1K output resistor R3. Set the spectrum analyzer frequency range to cover roughly 20Khz. Trim the Noise Adjust RT1 until the noise spectrum is of roughly equal amplitude across the whole spectrum. Trim the White Noise Gain Trim RT2 until the scope trace indicates peaks slikely past +/-5V output. Now place the scope probe on the Pink noise output prior to the 1K output resistor R8. Trim Pink gain RT4 until the scope trace indicates peaks slightly past +/-5V output. Trim the Slow random Gain RT3 until the scope trace indicates peaks slightly past +/-5V output. 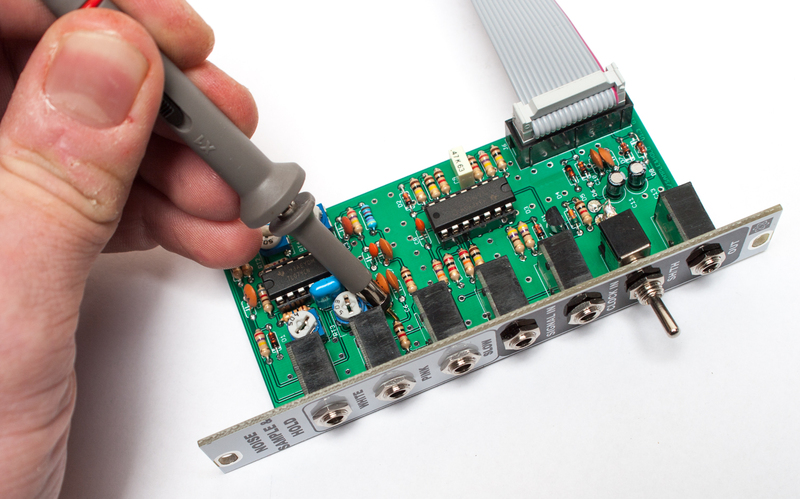 A narrow module that provides wide functionality! One question: how high a sample rate can this module achieve? Thanks! Great module. Noluck with the SH/TH. No output, but pinned to -12V. Any advise? Is the schematic available somewhere? I’m sorry that your Noise Sample and Hold isn’t working. First thing I would do is make sure that all the components are oriented properly as per the Bill of Materials, and ensure that all polarized components are oriented properly. Other than that, you could check the polarity protection diodes, and make sure they are passing voltage, and also all of the ICs, to make sure they are getting voltage. Hope this has helped. HI!! My 3 noises outputs works fine but I have only noise coming out of the main CV output… Any ideas? Thanx!! Hey Jenz! If you’re listening to the output, you’ll hear noise; and you can feed the clock an audio rate square wave to hear it sounding more and more bitcrushed the higher the frequency. When the output is plugged into the CV of a module, you should just get the random steps when S&H and a slurred CV in T&H. So it’s expected to hear noise 🙂 If you’re NOT getting CV you’re clocking it and plugging output into an oscillator, then there’s a problem.